Ben Ladouceur has quickly established himself as one of the young poets to read in Canada, with chapbooks from Ferno House, above/ground press, AngelHousePress (and previous titles from Apt. 9), appearances in literary journals, widespread readings, as well as his recent inclusion in The Best Canadian Poetry In English 2013. 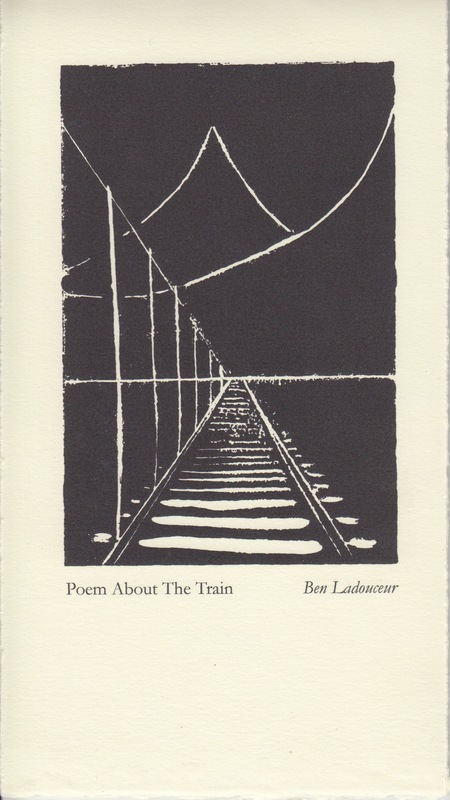 Poem About The Train sees Ladouceur return to a longer form, writing a train journey across the country in seven-parts. The train is a space of stasis and movement, gradual procession (with its attendant boredom) and sudden explosive growth. “A train is a childhood,” writes Ladouceur.